Collects Incredible Hulk (1962) #1-6, Fantastic Four (1961) #12, 25-26, Avengers (1963) #1-3, 5, Amazing Spider-Man (1963) #14, Tales to Astonish (1959) #59 and material from Journey Into Mystery (1952) #112. Dr. Robert Bruce Banner may look like a mild-mannered scientist, but after being caught in a gamma-bomb explosion, he became the unstoppable engine of destruction known as the Hulk! Stan Lee and Jack Kirby's atomic update on the Dr. Jekyll/Mr. Hyde paradigm mixed the might of giant monsters with Cold War intrigue and psychological drama. Decades later, it's a formula that still has readers clamoring for more! 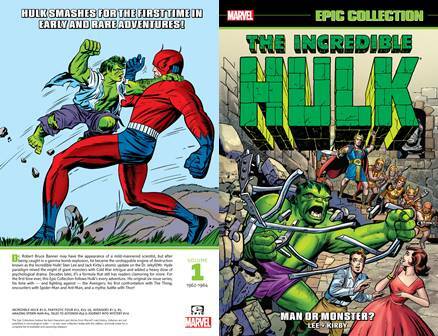 For the first time, this Epic Collection follows Hulk's every adventure: his original series, his time fighting alongside - and against - the Avengers, his first confrontation with the Thing, encounters with Spider-Man and Ant-Man, and a mythic battle with Thor! Collects Incredible Hulk (1962-1999) #436-448, Savage Hulk (1996) #1, Cutting Edge #1, Cable (1993) #34, Onslaught: Marvel Universe. Return of the Maestro?! Major Matt Talbot, nephew of the Hulk's old foe, Glenn, has set his sights on capturing the jade giant - and with Hulkbusters and the Ringmaster on his side, he might just succeed! Meanwhile, a terror group called the Alliance has pushed the world to the brink of nuclear war. But if the Leader's machinations are behind the Alliance's carnage, then why is the Hulk claiming credit - and why does he look like the Maestro? That's what Thor wants to know! 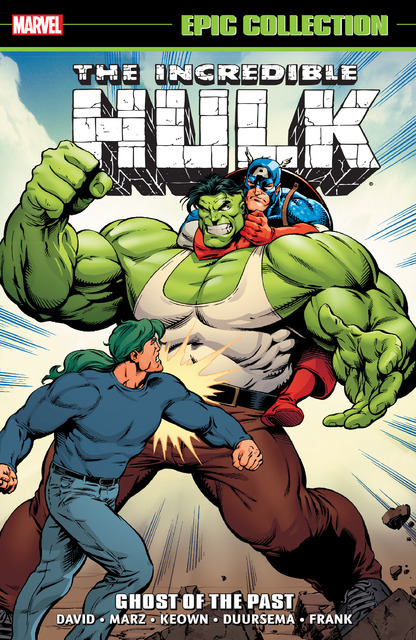 As She-Hulk and Doc Samson take center stage, Janis Jones arrives from the future - but when Onslaught does the impossible, physically separating Bruce Banner from the Incredible Hulk, everything will change for the green goliath! Collects Incredible Hulk (1962-1999) #102-117 and Annual #1, and material from Tales To Astonish (1959) #97-101 And Not Brand Echh #9. I smash, you smash, but nobody, nobody, smashes like Hulk smash! Leaping out of the pages of TALES TO ASTONISH and into his own ongoing title again, the Incredible Hulk has twice the space to shake the Earth with his mighty rage. And he'll need it! The Hulk travels far and wide - but doesn't make too many friends along the way! The jade giant's travelogue of destruction leaves the Mandarin, the Inhumans, the Sandman and the entire Savage Land rubbing sore jaws. And when Hulk's archnemesis the Leader returns, all bets are off - as writer Stan Lee joins with iconic Hulk artist Herb Trimpe (who makes his debut in this very volume!) to pull out all the stops! 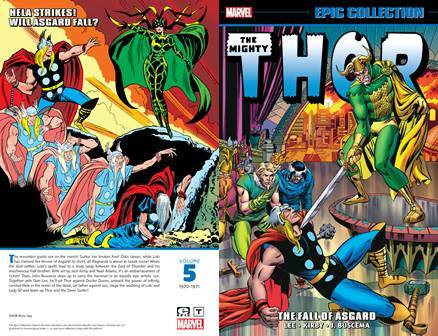 Collects Journey Into Mystery (1952) #110-125 and Annual #1, Thor (1966) #126-130, and material from Not Brand Echh #3. Stan Lee and Jack Kirby, the creative team that sparked the Marvel revolution, set off on Asgardian adventures featuring the fight to end all fights between Thor and the Incredible Hulk! There's also the return of the Grey Gargoyle, the debut of the Absorbing Man and the unstoppable Destroyer, Thor and Loki's exile to Skornheim and the introduction of Hercules and the Greek gods! And it all leads to an epic adventure that pits Thor against Hercules and concludes in the depths of Pluto's Underworld! Lest we forget, Tales of Asgard backs up every issue with the origins of Marvel's Norse pantheon of heroes, villains and mystic lands; the secrets of Ragnarok; and much more! 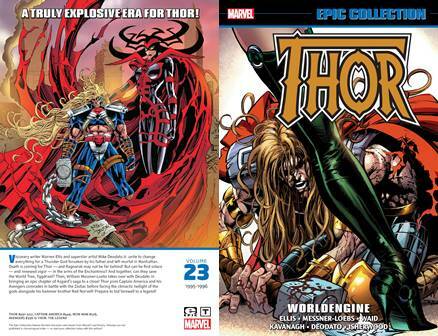 A truly explosive era for Thor! Visionary writer Warren Ellis and superstar artist Mike Deodato Jr. unite to change everything for a Thunder God forsaken by his father and left mortal in Manhattan. Death is coming for Thor - and Ragnarok may not be far behind! But can he find solace - and renewed vigor - in the arms of the Enchantress? And together, can they save the World Tree, Yggdrasil? Then, William Messner-Loebs takes over with Deodato in bringing an epic chapter of Asgard's saga to a close! Thor joins Captain America and his Avengers comrades in battle with the Zodiac before facing the climactic twilight of the gods alongside his hammer brother Red Norvell! Prepare to bid farewell to a legend! The mountain giants are on the march! Surtur has broken free! Odin sleeps while Loki has claimed the throne of Asgard! In short, all Ragnarok is about to break loose! And when the dust settles, Loki's spells will lead to a body swap between the God of Thunder and his mischievous half brother! 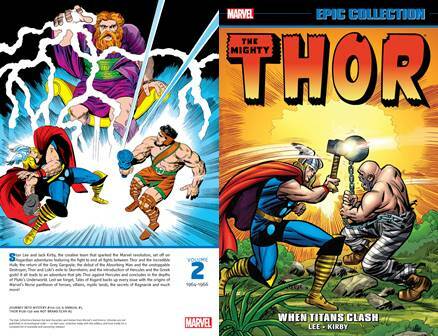 With art by Jack Kirby and Neal Adams, this Epic Collection is an embarrassment of riches - and John Buscema soon steps up to carry the hammer in an equally epic artistic run! Together with Stan Lee, he'll pit Thor against Doctor Doom, unleash the power of Infinity, combat Hela in the realm of the dead, set father against son, stage the wedding of Loki and Lady Sif and team up Thor and the Silver Surfer! 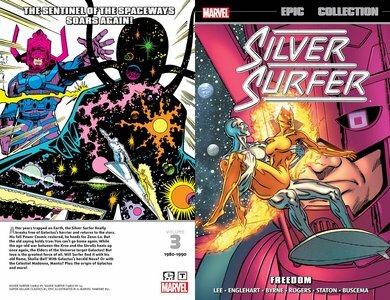 Collecting Silver Surfer (1987) #51-66, Annual #4; material from Marvel Comics Presents (1988) #69, 93-97. To Infinity and beyond! Follow the sentinel of the spaceways into a Marvel Universe-spanning cosmic extravaganza against the Mad Titan Thanos - who wears the Infinity Gauntlet! Drax battles Firelord, the Surfer fights the Rhino and Thanos forces Norrin to get introspective! But is this dimension big enough for the ultimate duel between the Silver Surfer and the Mad Titan? When the dust settles on Earth, the Surfer heads back into space, only to face Midnight, the Inhumans and the Collector! But how will that lead to him coming face to face with...Captain Mar-Vell? Plus, the Surfer faces the undead, joins Mr. Fantastic on an emergency mission, and takes on the Guardians of the Galaxy in the 26th century! And Nova goes solo! Collects Silver Surfer (1982) #1, Silver Surfer (1987) #1-14, Super-Villain Classics #1; material from Epic Illustrated #1, Marvel Fanfare (1982) #51. The sentinel of the spaceways soars again! After years trapped on Earth, the Silver Surfer finally breaks free of Galactus's barrier and returns to the stars. His full Power Cosmic restored, he heads for Zenn-La. But the old saying holds true: You can't go home again. While the age-old war between the Kree and the Skrulls heats up once again, the Elders of the Universe target Galactus! But love is the greatest force of all. Will Surfer find it with his old flame, Shalla-Bal? With Galactus's herald Nova? Or with the Celestial Madonna, Mantis? Plus: the origin of Galactus and more! 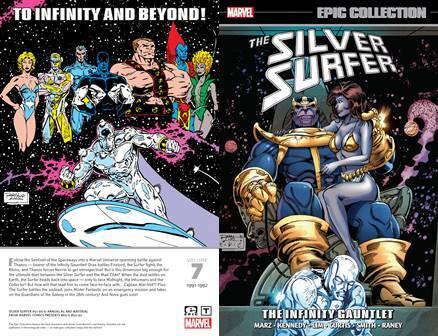 Collects Silver Surfer (1987-1998) #39-50, Annual #3; Thanos Quest #1-2 and material from Marvel Comics Presents (1988) #50. The Mad Titan is on a quest for Death! 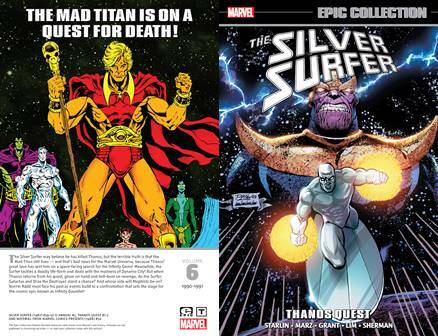 The Silver Surfer may believe he has killed Thanos, but the terrible truth is that the Mad Titan still lives - and that's bad news for the Marvel Universe, because Thanos' great love has sent him on a space-faring search for the Infinity Gems! Meanwhile, the Surfer tackles a deadly life-form and deals with the madness of Dynamo City! But when Thanos returns from his quest, glove on hand and hell-bent for revenge, do the Surfer, Galactus and Drax the Destroyer stand a chance? And whose side will Mephisto be on? Norrin Radd must face his past as events build to a confrontation that sets the stage for the cosmic epic known as INFINITY GAUNTLET! Collects Marvel Feature (1971) #11-12, Marvel Two-In-One (1974) #1-19 and Marvel Team-Up (1972) #47. Watch out, Yancy Street! Benjamin Grimm, A.K.A. the Fantastic Four's ever-lovin' blue-eyed Thing, is stomping his way into his own series - guest-starring the greatest heroes in the Marvel Universe! 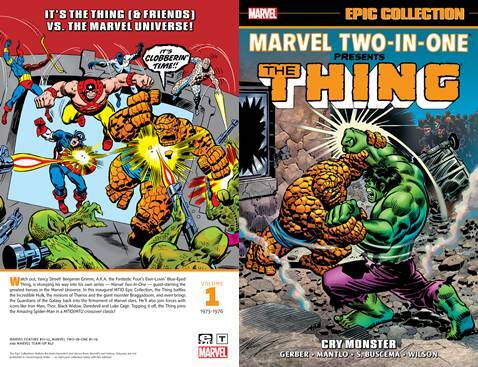 In this inaugural MARVEL TWO-IN-ONE Epic Collection, the Thing battles the Incredible Hulk, the minions of Thanos and the giant monster Braggadoom - and even brings the Guardians of the Galaxy back into the firmament of Marvel stars! He also joins forces with icons like Iron Man, Thor, Black Widow, Daredevil and Luke Cage to battle all manner of fearsome foes! And to top it all off, the Thing travels to the pages of MARVEL TEAM-UP to join the amazing Spider-Man in a MTIO/MTU crossover classic! The Fantastic Four, like never before! With Reed, Sue, Ben and Johnny out of commission, a new FF comes together: Spider-Man, Wolverine, Ghost Rider and the Hulk! But what monstrous threat could bring these heroes together? And how are the Mole Man and the Skrulls involved? Maybe the real FF can help figure all that out! Then, the one, true Doom returns - and a time-jumping battle for the ages with Mister Fantastic ensues! Did we say time? Uh-oh, better hope nobody tells the Time Variance Authority! The Thing battles the Wrecker before a fantastic new era begins - and a stunning revelation rocks the marriage of Johnny Storm and Alicia Masters! 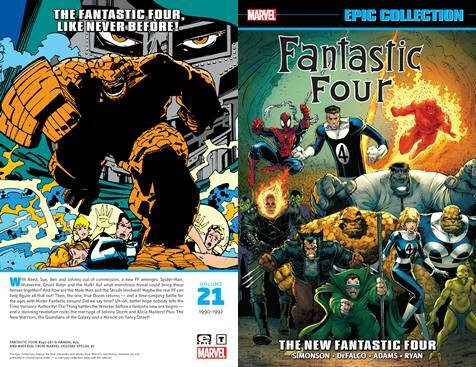 Plus: The New Warriors, the Guardians of the Galaxy and a Miracle on Yancy Street! 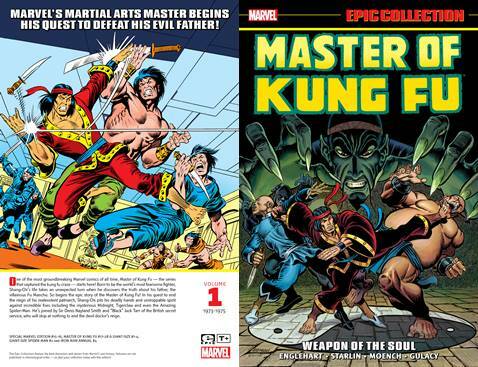 Collects Special Marvel Edition (1971) #15-16; Master of Kung Fu (1974) 17-28; Giant-Size Master of Kung Fu (1974) 1-4; Giant-Size Spider-Man (1974) 2 and material from Iron Man Annual (1970) #4. One of the most groundbreaking Marvel comics of all time! The seriesthat captured the kung fu craze starts here! Born to be the world's most fearsome fighter, Shang-Chi's life takes an unexpected turn when hediscovers the truth about his father, the villainous Fu Manchu. Sobegins the epic story of the Master of Kung Fu! In his quest to end thereign of his malevolent patriarch, Shang-Chi pits his deadly hands andunstoppable spirit against incredible foes like Midnight, Tiger-Claw...and even the Amazing Spider-Man! He's joined by Sir Denis Nayland Smith and "Black" Jack Tarr of the British secret service, who will stop atnothing to end the devil doctor's reign. Collects X-Terminators #1-4, New Mutants (1983) #71-85. From the horror of Limbo to the glory of Asgard! As the fires of Inferno burn, the New Mutants must escape Magik's dark domain - but that leaves the way open for S'ym and his demons to invade Earth! Luckily, X-Factor's former wards, the X-Terminators, are on the scene! Can Rusty, Skids, Boom-Boom, Rictor, Artie, Leech and Wiz Kid help the New Mutants repel an army of demons and save Magik's soul? Then, when Hela's evil spell corrupts Mirage's Valkyrie side, Doctor Strange lends a magical hand! But to cure Mirage completely, the New Mutants must travel to Asgard, home of the mighty Norse gods! The trouble is, Hela is scheming to murder Odin and conquer Asgard! Will a handful of mortal mutants be enough to defeat the Goddess of Death? 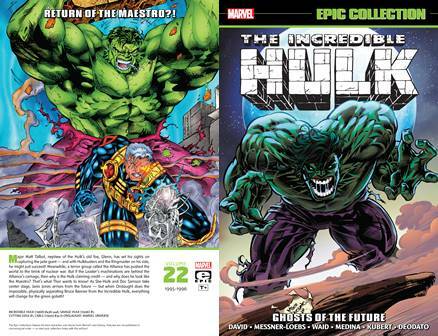 Collects Incredible Hulk (1968) #407-419, Annual #20; Hulk: Future Imperfect #1-2 and material from Incredible Hulk Ashcan edition & Marvel Holiday Special #3. Witness the Incredible Hulk's terrifying future! Could our hero truly be destined to rule a ravaged world with a gamma fist as the despotic Maestro?! Or can a time-torn Bruce Banner change his own nightmarish fate? One of the greatest Hulk tales ever told fully earns its Epic status! 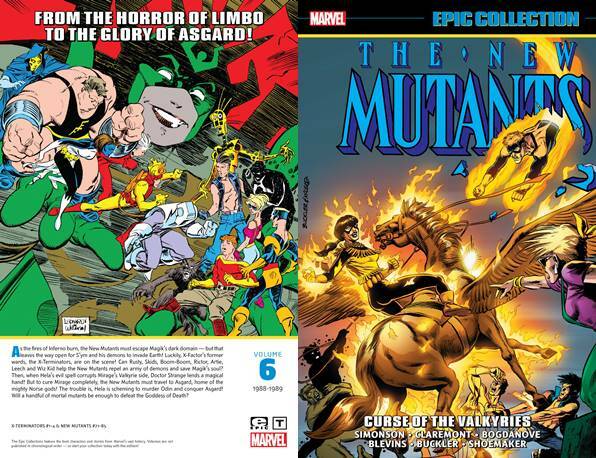 Plus: more adventures with Bruce, Rick Jones and the Pantheon! A monster at Loch Ness - but not the one Hulk went looking for! A showdown with Nick Fury! A royal rumble with Madman! Hulk and She-Hulk double-team the Bi-Beast! Silver Surfer and the Starjammers join the intergalactic Troyjan War! And Rick is getting married... if he can survive his bachelor party! Collects Giant-Size X-Men (1975) #1, Uncanny X-Men (1963) #94-110, Marvel Team-Up (1972) #53, 69-70, Annual (1976) #1, Iron Fist (1975) #14-15 and material from FOOM (1973) #10. With the original X-Men captured, Professor X recruits an all-new, all-different team to take on the mantle of the Uncanny X-Men! Including Wolverine, Storm, Colossus, Nightcrawler, Banshee, Sunfire and Thunderbird, this new international cast redefined super-hero teams forever. The transition from old team to new won't come easy, though: WOLVERINE VS. THE PUNISHER and Cyclops clash! X-Man battles X-Man! Death and rebirth visit the team! And an old nemesis returns! Plus: the first hints of Alpha Flight and the Weapon X program, the team's first outer-space saga with the Starjammers, and rare early X-Men adventures! With comic-book titans Chris Claremont, Dave Cockrum and John Byrne at the helm, the X-Men's rise to the peak of popularity starts here! Collects X-Force (1991) #1-15, Annual #1; Spider-Man (1990) #16; Wolverine (1988) #54. Collects Incredible Hulk (1968) #397-406, Incredible Hulk Annual #18-19 and material from Namor the Sub-Mariner Annual #2, Silver Surfer Annual #5, Dr. Strange, Sorcerer Supreme Annual #2 and Marvel Holiday Special #2. As one Leader falls, another rises! 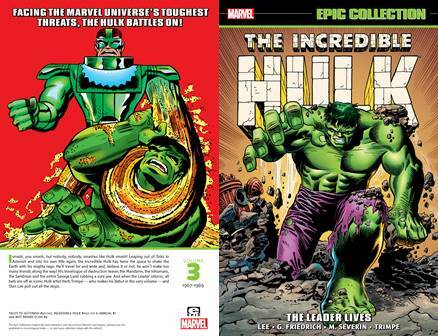 An epic clash between the Hulk, the Leader and the U-Foes is going to end very badly for the Gamma-brained villain. Rick Jones' girlfriend, Marlo, won't fare any better: She dies! But thankfully, that's not the end of her story. 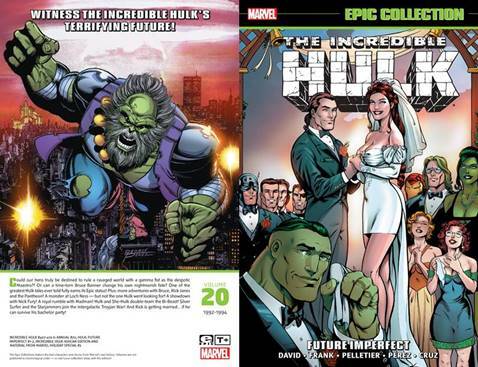 As for the Hulk, he's about to get an offer he can't refuse - one that puts him in charge of the Pantheon! He'll have his hands full with the Juggernaut, the Avengers and Doc Samson. But when Dumb Magician, Fish Man and Shiny-Face show up, it can only mean one thing: the return of the Defenders! Collects Captain Britain (1976) #1-2; Excalibur (1988) #1-11, Special Edition, Mojo Mayhem and material from Mighty World of Marvel #7, 14-15; Marvel Comics Presents (1988) #31-38. A legendary team is born! Meet the United Kingdom's champion, Captain Britain, and his paramour, the metamorphic Meggan! They'll band together with former X-Men Nightcrawler and Kitty Pryde when Gatecrasher and her Technet are sent to capture Rachel "Phoenix" Summers! From their lighthouse base, the heroes of Excalibur will tackle the ferocious Warwolves, the unstoppable Juggernaut and Mojo mayhem! 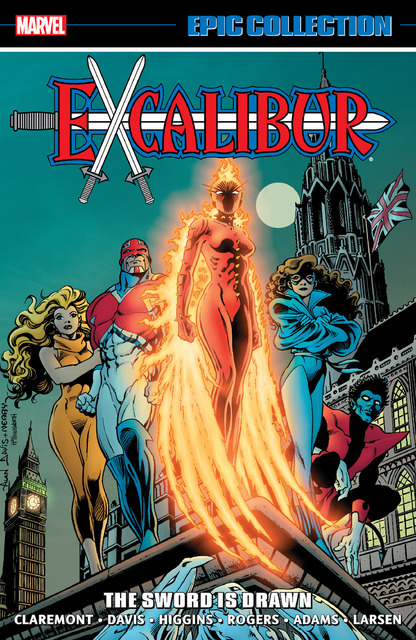 Things get wild with Arcade, the Crazy Gang and the X-Babies — and really heat up as Excalibur is drawn across the Atlantic to an Inferno raging in New York! And don't forget Lightning Squad, the alternate Nazi versions of Excalibur! Plus: Who or what is Widget? Collects Power Man and Iron Fist #71-72, 74-89; Daredevil (1964) #178. Payback time! But for the Heroes for Hire, vengeance cuts both ways. When the killing machine known as Warhawk beats Danny to a pulp, Luke will take his pound of flesh in return. But he's not the only one out to settle a score. The terrifying tag-team of Sabretooth and Constrictor are old foes out for blood — and to get the message across, they target Power Man and Iron Fist's friends! And they're not Luke and Danny's only headache, as the heroes must take on the malignant Mole Man and the mountain-climbing Montenegro! Then there's one of their strangest gigs: finding the missing vigilante Moon Knight! But when the heroes are hired to protect the lawyers Nelson and Murdock, will their biggest problem be Daredevil? Collects Marvel Graphic Novel #4, New Mutants (1983) #1-12, Uncanny X-Men (1981) #167, Marvel Team-Up Annual #6, Magik (1983) #1-4 and material from Marvel Team-Up (1972) #100. Meet the future of the X-Men! Karma. Wolfsbane. Sunspot. Cannonball. Moonstar. They're teenagers, thrown together by the X-gene that makes them different. Follow the adventures of these young mutants from Karma's first meeting with Spider-Man and the Fantastic Four to their early days at the Xavier School! The New Mutants' on-the-job training begins in earnest with battles against Sentinels, the Silver Samurai, Viper and the Hellfire Club; a team-up with Spidey and Cloak and Dagger — and the team gets a taste of life as X-Men in a disturbing encounter with the Brood! Plus: Meet fiery new recruit Magma, and discover how Colossus's sister, Illyana, became the demon sorceress known as Magik!